Cullowhee is located in the Great Smoky and Blue Ridge Mountains, 52 miles west of Asheville. The community name for Cullowhee derives from a Cherokee term for “Place of the Lilies”. 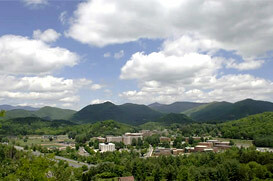 Located in Jackson County, Cullowhee is best known as being the home of Western Carolina University. The university enrolls 9000 students in more than 120 majors and 30 graduate programs. Students hail from more than 38 states and 32 countries. The growing university recently built a $30 million fine arts center which is part of a construction project that will double the size of the campus. Western Carolina was the first public university in the state to require students to have a personal computer. The university’s mission is focused on quality education and preparation for responsible citizenship in a changing world. Since its founding, WCU has grown in size to become a major cultural, scientific, and educational force in the region and state. Not only that, but they’re still growing, recently purchasing hundreds of acres adjacent to the university. At an elevation of 2116 feet, about 3600 permanent residents live in Cullowhee. Some of the communities surrounding Cullowhee include Webster, Sylva, Balsam, Whittier, Tuckasegee, Cherokee, and Fontana. Contact us for lots, land, residential and commercial real estate in the Cullowhee community. Real estate prices range from $50,000 to over $1,000,000. We have foreclosures and bank owned properties in Cullowhee.